Are you ready for Industrie 4.0? We'll prepare you for the intelligent production of tomorrow! Industrie 4.0 is more than a vision of the future. Intelligent networking is a huge opportunity for industry. Flexible production can help you make optimum use of your plant. Manufacture customised products at the cost of mass production and increase your plant's productivity! Few companies are applying Industrie 4.0 in their own production. We would like to demonstrate the potential of Industrie 4.0! Pilz is a full member of the technology initiative SmartFactoryKL, the factory of the future. Together we are developing new concepts, standards and solutions for highly flexible automation technology. Benefit from the knowledge we have acquired together and take advantage of flexible, individual, safe automation processes! For several years now, a modular plant structure has been seen as the key to greater flexibility in production. 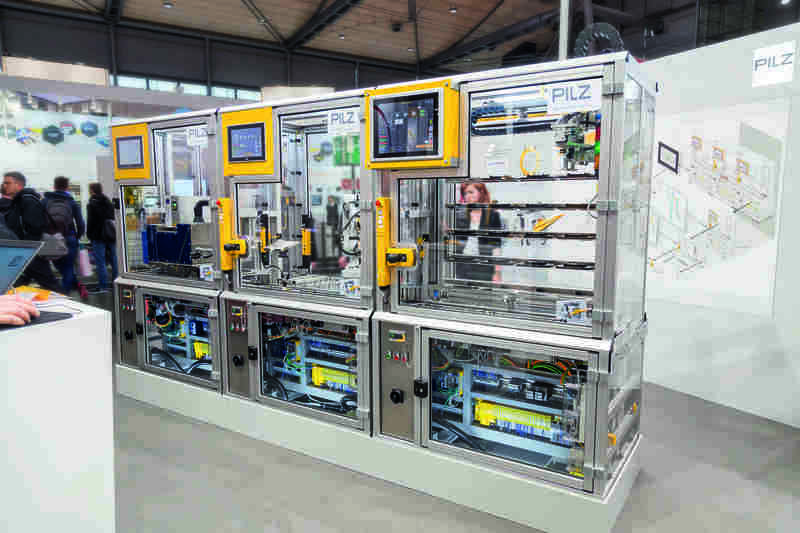 For the 2016 Hannover Messe, Pilz created a factory of the future. The plant illustrates communication between distributed automation systems in cooperation with actuator and sensor technology. The Industrie 4.0-compatible automation system PSS 4000 coordinates the sequence of all networked components for safety and automation: from engineering to visualisation. With our solutions it is simple to represent complex plant and machinery with sophisticated functions, such as those needed on digital networked systems. Want to know what it looks like? Then take a look at our Explain It video for the smart factory!